Police, Coastguard and Border officials are currently dealing with a “complex” incident involving stowaways aboard a container vessel in the Thames estuary. The incident, which a Home Office spokesperson said was initially reported off the coast of Ramsgate, is thought to involve threats to crew members made by the stowaways on the Grande Tema. The vessel was travelling from Nigeria to Tilbury. An Essex Police spokesperson added: “We were called at around 9.15am today, Friday, December 21, with reports of an incident on board a vessel in the Thames Estuary. The Italian registered vessel is currently circling in the estuary. The police spokesman added that the call “relating to the safety of crew on board” does not appear to involve any injuries. 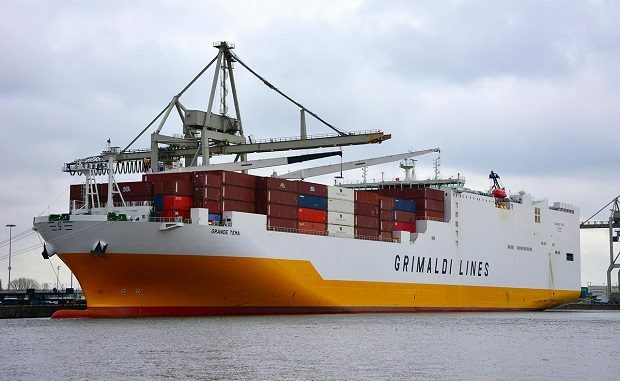 According to Sky News shipping operator Grimaldi Lines have confirmed four migrants aboard the vessel have threatened staff with iron bars. Paul Kyprianou, of Grimaldi Lines, says the crew have locked themselves on the Bridge. I worry that potential migrants to Britain are being conned by people -smugglers into believing that it will all change if Brexit actually happens and that it will then, somehow, become more difficult to enter Britain (the White Cliffs will suddenly grow much higher, or something). This callous deception may lead to the sight of cold, shivering people in the middle of the Channel in flimsy , open boats or, indeed, stowing away on ships destined for Britain. I feel very sorry for anybody who believes these lies, that Brexit will make any difference to non-permitted migration at all. In fact, it will only deter people thinking of using the normal channels to get to Britain. The others will carry on as before. Illegal immigrants originating from non-EU countries that enter this country are very few. The greater problem is those who are “facilitated” to cross European countries by those European countries themselves. Many of those who voted in favour of Brexit did so out of concern that this country was being flooded by legal immigrants from Europe and that this was a major factor leading to housing shortage, overcrowded schools and longer waiting lists for doctors and hospital appointments. I think the majority of the electorate have the intelligence to differentiate between legal and illegal immigrants.